Description: 11 sentiments especially tailored around the arrival of a precious little baby. 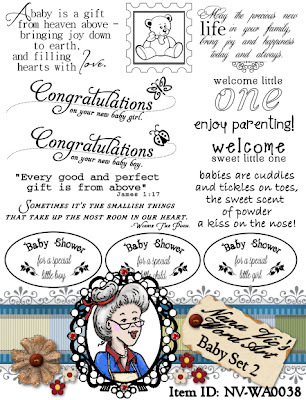 A gorgeous mix of word art suitable for either a handsome baby boy or a cute baby girl. Use the word art on your scrapbooking, card making or country crafting projects. Bonus digitals included; Stamp with a little bear in it. The automatic download contains 12 individual JPG and semi-transparent PNG files, 2 full sheets in JPG and PNG and a cover JPG image. All are in 300 dpi for easy re-sizing. Such special word art for the special new little someone's to welcome in a family. I especially love the Baby Shower word art...first time I've seen something like that.